At the park where I power walk, I spotted a few couples comprised of wildly disparate ages. No, they weren’t romantic partners from what I could deduct. Rather, they appeared to be son, daughter or grandchild walking and talking with their parent or grandparent. Or they may have been neighbors or others, good friends. I didn’t want to impinge on their privacy but observing them gave me great pleasure. The energy of spirited discussions which accompanied quick footsteps or the meditative quiet as they strolled–reasons to appreciate their presence. One twosome sat on a bench and pointed out abundant water fowl, naming many, enjoying the water’s painterly reflections. They all appeared glad to be in each other’s company. 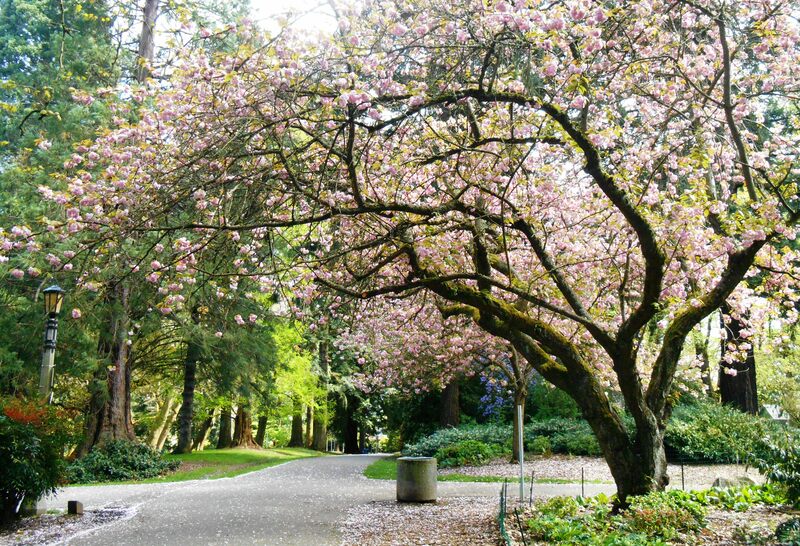 This park is, as are all safe and well-kept public parks, popular for recreational pursuits. One side is devoted to basketball, kickball or volleryball or soccer with a busy jungle gym and swings nearby. On the other side of the street the pathways continue in hilly loops around an ample, tranquil pond, then past an off-leash area for dogs and sprawling picnic areas. I can easily spend forty-five minutes there and still be loath to leave. The rich light filtering through old trees changes moment by moment. The park always infuses my spirit with examples of life being lived well. There there are homeless folks, too, who seek sanctuary, as well they might. The lush, varied spaces welcome everyone. 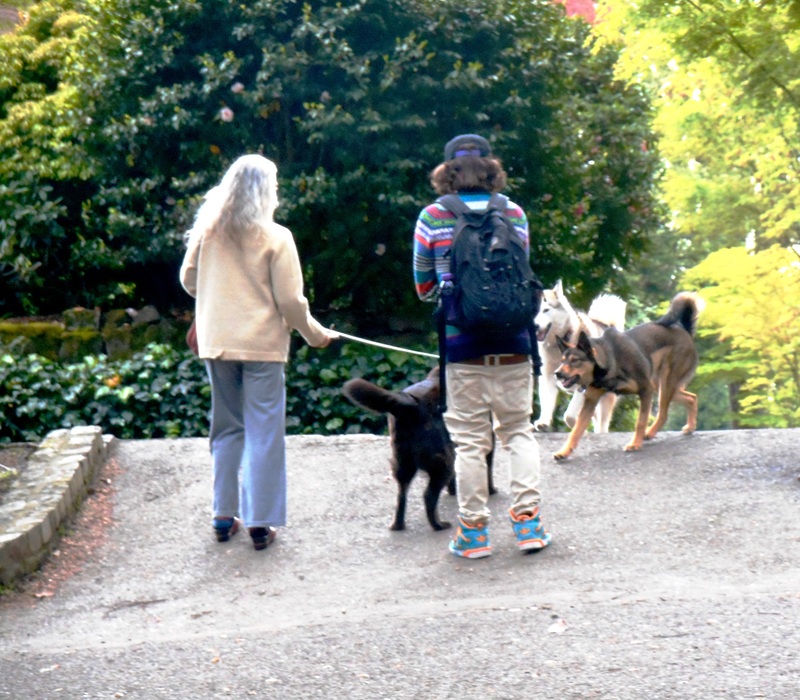 People (and dogs) romp, barbecue, read, make music, meditate, practice Tai Chi and sleep. Meet friends and lovers and family. Today I saw a group of role playing older teens in full costume. It’s a fine place to witness generations interacting, particularly parents and younger children. Yet I do not as often see children, teenagers or younger adults with men and women between the ages of sixty and ninety (or older). These are often previous careerists who are now focused on other activities, whether it’s sitting on a porch crocheting, running a marathon or developing another business. Illness may alter their lives, slow some down. So can loneliness. I wonder how many of our older citizens visit with families and friends enough? Likely not that many. Much of our culture doesn’t encourage intermixing of young and old. Unless it is already a long-held tradition, reflective of one’s ethnicity or part of social mores, it can be easy to gloss over ties to relatives and other important persons once integral to quality of living. Relationships become transitory with a pick-up-and-go society. We often meet others online or text whole conversations on cell phones. There is so much distraction that we forget the visit, the call, the time spent face-to-face with those we insist do matter. I don’t want to lapse into sentimental nostalgia. I wonder if my viewpoint arises from having parents who were forty when I was born. As a youngster, I spent time with many silver-haired people (very few dyed their hair) and found them quite nice, fascinating with such varied life experiences. Still, we don’t necessarily cherish great and grand memories of family, neighbors or long ago friends, or at least not without equally impressive hard times recalled. Most of us, however, can yet recall enough occasions of togetherness that were momentous or contented, even happy. Love found its way into those gatherings with a few someones and in time the good will spread out, repeating acts of care. I recently wrote a post about summer Missourian visits to see my aunts, both lovable characters, and an uncle and cousin (which you can find here: 2015/03/25/summer-trips-the-kelly-girls/). But I had many other cousins and uncles. My mother was one of thirteen children, many of whom were alive when I was born. My father, one of three brothers. Though I never got to meet my maternal grandparents, I did know my father’s parents. We stopped at their place each summer, as well. Many cousins, aunts and uncles had moved to other places, so were less well-known. But they came whenever they could to the common ground or we travelled to their homes, at times. When we joined forces at relatives’ houses and yards it was entertaining, a bit crazy: lots of kids racing and yelling and playing games; tables laden with a large variety of home cooked food, conversations that veered from updates of life circumstances to detailed health updates to general gossip in lowered voices to worries and hopes about the future of the country and world. My family was a bunch of talkers; kids could wedge in some words. My elders expected respectful exchanges but they were interested in what I accomplished in school, what I enjoyed doing for fun, who my friends were, what I was going to do with myself when I grew up. And I, in turn, held on to their offerings, sought their affection. They knew things I didn’t. Some had been to Europe both before and after terrible wars they fought in. But even if it was Arkansas, Texas or Colorado I wanted to see the slide shows and photos, hear at least a good chunk of the travelogues. There was an uncle who owned a plumbing business, something so different from my musician and teacher parents that his world seemed exotic. I peppered him with questions. An aunt had a thriving seamstress business. Her descriptions of fabrics, designs that worked and those that did not–even the countless buttons and thread types explained were like a litany of small delights. Witty vignettes about their customers or past spouses captivated me (divorce was not at all good in our religious family but sometimes, it seemed, could not be avoided). One uncle was a high school coach; his daughters were my favorite girl cousins. Another was a music professor, flutist and prolific composer. A grown second cousin revelled in being domestically talented, which impressed me since I had very few domestic leanings. They all did and said things that inspired, intrigued, motivated, and guided me somehow. They introduced me to different ways of being and doing. Plus, lest it seem I am only on a serious note, those Missourians were plain fun to hang out with. Laughter is a constant in my memories and even now when who is left meets. So, too, were the majority of older guests my parents welcomed into their home good-natured. How fortunate I was to know at least one set of grandparents fairly well. Grandfather Will ran a public school system and read voraciously, wrote poetry and essays, encouraged me to write more. His presence had a leavening effect on my life. Grandmother Ida worked hard in her garden and I followed her around, picking tomato worms off fat red orbs, choosing brilliant flowers for display on the dining room’s lacey tablecloth. It was she who patiently taught me to peel a potato so its tough skin came off in a curl, showed me how to decorate a pie with cuts in the top crust. Her quiet presence was certainly well noted. They made up some of the best of my life, those adults who fussed at me, corralled my energy, sought my ideas and exercised their considerable opinions in group conversations that lasted hours. The older ones modelled examples of whom to become as a grown up–or not to become. I sensed the deep reach of the past, the connectedness through time and this helped me more fully thrive in the present. Envision my own future better by paying attention to it all. The young adults were like sisters and brothers who had run the gauntlet of adolescence, were powerful in victory and seasoned by defeat. I aspired to their smart decisions or worthy careers. Rooted for them if they backslided. My youngest cousins were some of my best friends. How could I not find pleasure in a fierce family game of badminton or croquet, ghost stories as we huddled under covers, tag played in the dark amid moths and mosquitos and scents of summer? Even for one summer each year. I waited all winter for it. When children’s lives entwine with a few generations, they learn to better value not only the young and old, but also themselves. The past and present overlap visibly and invisibly. If there is loving involvement in the everyday as well as special occasions, it begins to permeate one’s world view like osmosis. A feeling of belonging not only in the family but in the greater world is more likely to root itself and flourish. I’m not discounting the failures that happen, the breathtaking losses families inevitably experience. Disagreements that may linger. We have all been through things never imagined, with likely more to come. But for those, there is this: sitting in a circle, passing a handkerchief with cups of coffee or tea, remembering better times and praying for relief. Taking each other’s hands in your own. Later, making phone calls, writing letters that offer solace. When troubles are shared, they become more endurable. And out of that dark time arises the will to go on. There is that net beneath us made strong with the care of all who love us. We have five grandchildren. One is barely known as he has lived far from us all his life. It has been challenging to stay connected. It may be too late, as he is still at a distance in more ways than one, a grown man. But I still hold out hope. Two others who are older have been in and out of our lives due to parental life changes. They finally moved to our city with a daughter so we have gotten to know each better in recent years. I try to show them my love is real and won’t disappear. They are always my family despite time and space gaps, despite the fact that I have been their mom’s stepmother since she was five. And there are two with whom we have been more up close and personal since their births. They remain in my life in significant ways. But I wonder how much longer this will be, for any of the four nearby. I recently took my soon-to-be thirteen year old granddaughter ice skating. We had a ball gliding about. We can shop for hours. We are going to attend a dance concert for her birthday. I feel her start to move beyond my easy reach yet know it is part of inevitable transitions. We still made Easter eggs with her brother. My nine-year old grandson loves to draw and paint with us and enjoys hunting and identifying rocks. We have hiked in mountains and walked seashores. My husband and I play Scrabble, checkers, dominoes and more with them. We attend school events. I correct their manners if they forget because manners make far more difference than they can know yet. They voicalize family complaints; I try to stay neutral. We share many meals with them and the rest of our good-sized family. I can offer a listening ear and hugs when they are hurt or angry or discontent. And pray for them all, that they might cross through the vast reaches of their lives with a firm hold on honor and dignity, a philosophical sense of things when encountering hardship. Is this enough to offer as they navigate an increasingly complex and treacherous world? Will they grow up feeling the strength of such love, will they be secure in the knowledge that their families are here? The thought of my leaving them one day suddenly grieves me–not being around for my children, their children and with all our other relatives. Then I remember: I was blessed by previous generations. They followed me into my own adulthood in some way or other. They keep me company, still, as I grow older. I dream of those who have left, and their faces shine. They formed the major part of the foundation of my living. They were so many things to me, strong and resilient, faithful and forgiving, shaped by creativity and good humor. And, too, there were weaknesses and foibles. I have loved them for it all. I can pass on what I have received. We each have the task of sorting and strengthening bonds that matter most, and the opportunity to carry forward the good we have been given. The common wisdom we have is gathered like imperishable riches. So at the park today it was satisfying to see folks moving and resting in concert with each other, younger and older. I hope they were related by blood, but if not they were connected by interest. Perhaps by the strength of the deeper heart. I could see it in the way they leaned toward each other, how they talked, what they experienced together. This day will be another that remians with them if they remember the details or not. The cumulative benefits will be reaped. We are all on our way to tomorrow. We find our way better with each other. Community is so essential to a full life. I think here in our small towns in Italy we’re blessed that everyone, young, old, and kids, gather in front of doors or sit out in the plazas just to spend time chatting together. Many a pleasant evening is whiled away in this way. And it’s such a great gift in our lives! Thanks for reminding us, Cynthia, that we’re here for others! Sounds like you have the best of all worlds regarding intergenerational interactions. That’s wonderful for you living in this area. I am sure the kids grow up to know what counts in this way! Thanks for reading and sharing your responses, Sheila. A narrative for life. Beautifully written. I could relate in so many ways. I’m an older mother, a sister of five siblings. Some of my best friends are years younger. The diversity of generations is an unexpected gift that finds both sides as winners. What a gracious and eloquent response. And I’m so glad you share a faith in cross-generational sharing and caring. Thanks once more for your comment!